Hooray for the great English summer! Just when you thought the sunshine would last, September brings us a torrent of rain. On come the trousers and tights and back comes the pale pallid complexion. 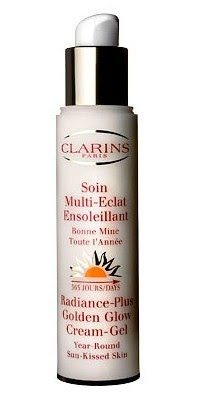 This is where Clarins Radiance Golden Glow comes to the rescue. Although it doesn’t contain sunscreen, it promises to replace that deathly shade of pale with a new coat of loveliness. Among many of the creams for the face I’ve tried and tested, this particular one does it’s job well. The cream itself is not like the colour of fake tanner and doesn’t smell like it either. Easy to apply, it smoothes on and sinks in beautifully. If you are particularly white, it’s best to mix a little of the cream with your regular moisturiser to maintain a seamless look for the full 365 days of the year. The only word of warning I would give is to make sure you wash your hands thoroughly after use to avoid the dreaded streaky palms! With added vitamins of A and E, Pro – Vitamin B5 this product is for all skin types and is allergy tested. No fear of your face breaking out with this one then! It has a hefty £25 price tag but to ensure your skin stays at it’s best, it’s worth every penny.